September 2016: Lassen National Forest releases draft winter travel plan. As a test case for future winter travel management on forests across the country, it still needs work. The 2015 Over-Snow Vehicle (OSV) Rule, which requires that every forest that receives enough snow for winter recreation develop a travel management plan for over-snow vehicles, was a huge policy win for Winter Wildlands Alliance. Now that the Rule is in place, we have shifted our attention to making sure that it gets implemented in a timely and appropriate manner. On the “timely” end, it’s important to note that not every forest is tackling winter travel planning right off the bat. The process takes time and resources, and we are working with partners across the country — locally and nationally — to move winter travel planning to the top of the priority list for those forests where current over-snow vehicle management is causing conflicts with skiers or impacting forest resources. Right now there are nine National Forests undertaking some level of winter travel management and we’re working to ensure that these early adopters get it right and set good examples for other forests to follow. The first forest to write a winter travel plan entirely under the new Rule is nearing the finish line. The Lassen National Forest, in California’s northern Sierra, recently published a draft Record of Decision and final Environmental Impact Statement for its winter travel plan. 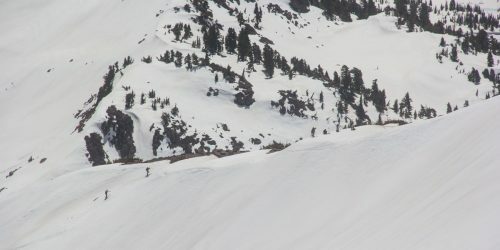 Winter Wildlands Alliance and our partners at Snowlands Network have worked with the Forest Service, local skiers, and other winter recreation stakeholders to find common agreement on how over-snow vehicles should be managed on the Lassen in the future. After talking with local skiers about where they recreate on the Lassen, and consulting with wildlife biologists and wilderness advocates to learn more about which areas of the forest needed to be protected for conservation reasons, we developed a potential plan (an “Alternative” in Forest Service parlance) for the Forest Service to consider as they weighed their options for what the new winter travel plan would look like. The motorized community also developed an Alternative. In the end, what the Forest Service has chosen as their draft plan is an amalgamation of the two alternatives that we and the snowmobile community developed. The Selected Alternative, or draft plan, isn’t perfect but it’s pretty good. The Forest Service incorporated most of our recommendations about important non-motorized recreation areas, and the draft plan prohibits winter motorized use in these areas. The plan also prohibits over-snow vehicles (OSVs) in important conservation areas like recommended wilderness and Research Natural Areas. All the same, there is room for improvement. The draft plan would allow OSVs on one of the few official cross-country ski trails on the Lassen National Forest – the Dry Lake trail, which is part of the McGowan cross-country ski trail system – and does not go far enough in protecting quiet non-motorized recreation experiences on and around the McGowan ski trails. “Open unless designated closed” and “closed unless designated open” may sound like two sides of the same coin, but the difference is more than semantic. We are particularly interested in how the Lassen approaches the winter travel planning process because it is the test-case for how winter travel planning will occur on other forests across the country. Which is why we need to make sure the OSV Rule is implemented appropriately. A major piece of the 2015 Rule, which makes over-snow vehicle management different under the new regulations versus how they’re currently managed, is that the Rule specifies that National Forest lands are, by default, closed to OSVs unless they are specifically designated as open. Currently, on most forests, OSVs are allowed anywhere they can physically travel with the exception of areas that are specifically closed. Under the new rule, however, when forests write winter travel plans they are supposed to identify specific areas where OSV use is appropriate and designate those areas as open, with the remainder of the forest being closed by default. Although “open unless designated closed” and “closed unless designated open” may sound like two sides of the same coin, the difference is more than semantic. A “closed unless designated open” policy requires that the Forest Service take a hard look at how winter motorized use impacts non-motorized recreation, wildlife, and natural resources and then determine where OSV use is truly appropriate. In contrast, the old “open unless designated closed” policy assumes that OSV use is appropriate everywhere unless it can be proven otherwise. Under this policy the vast majority of Forest Service lands are open to winter motorized recreation by default, including critical wildlife winter range, recommended wilderness areas, and sensitive environmental areas. For skiers, this has meant that outside of wilderness, in most of the places where we ski we’ve had to compete with snowmobiles for access to untracked powder, or had to contend with breathing in exhaust and listening to engine brraaps instead of breathing fresh mountain air and soaking up the silence of a winter’s day. Unfortunately, the Lassen did not set the example we were hoping for when it comes to switching over to a “closed unless designated open” management framework. It’s a big shift, and the Forest Service is not exactly the most nimble agency, so making the shift is sort of like getting a huge ship to change course. The Lassen’s plan does refer to “areas designated for OSV use” and “areas not designated for cross-country OSV use” but in reality the map still shows a forest where OSV use is allowed everywhere except a few distinct areas where it’s prohibited. Low elevation areas that rarely receive snow, including 50% of the forest’s mule deer winter range, remain open to OSVs in the draft plan. The draft plan also fails to provide provide projections for rare and threatened wildlife species such as the Sierra Nevada red fox. 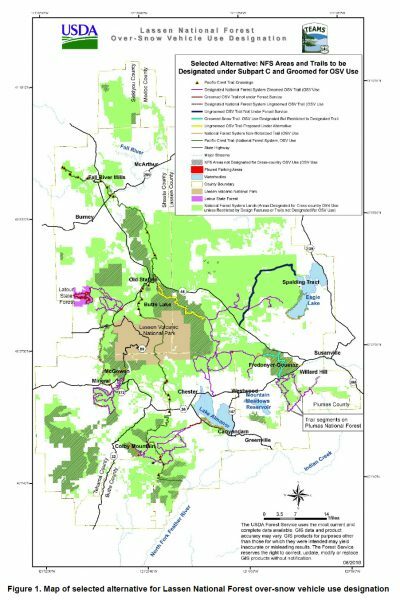 Overall, the draft plan designates 78% of the Lassen National Forest as open to cross-country OSV travel. In short, while the draft plan does prohibit OSV use within most of the important non-motorized recreation areas on the Lassen, it misses the mark when it comes to thoughtfully designating specific areas where OSV use is appropriate and instead relies on the old paradigm of allowing OSV use everywhere except specific areas where it’s prohibited. Of course, we’re not quite finished – it’s only a draft plan right now – and Winter Wildlands Alliance will continue our work to ensure appropriate implementation of the Over-Snow Vehicle Rule. You can find out more about winter travel planning on the Lassen and other forests in California by visiting our California travel planning page.